Twin Dragons (also known as Shuang long hui and Brother vs. 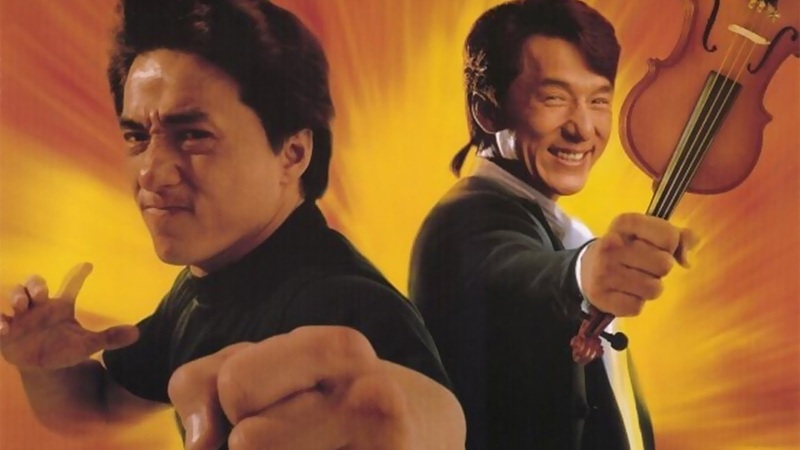 Brother) is a 1992 Hong Kong action comedy film directed by Ringo Lam and Tsui Hark, and starring Jackie Chan in two roles as a pair of twin brothers. "In 1965, a couple (Sylvia Chang and James Wong) are doting on their newborn twin boys. Meanwhile, a dangerous gang leader named Crazy Kung (Kirk Wong) is being transported as a captive in the same hospital. Crazy Kung escapes and attempts to take one of the twins hostage. In the ensuing chaos, the twins are permanently separated. One of them, named Ma Yau, is raised by his parents and grows up to be a concert pianist and conductor. The other, named Wan Ma, is raised by a woman named Tsui (Mabel Cheung), and grows up to be a street racer and martial artist. Neither of them has ever thought that he has a twin brother. 26 years later, the twins' (Jackie Chan) lives intersect in Hong Kong. Wan Ma and his best friend Tyson (Teddy Robin) get mixed up with a dangerous gang. Meanwhile, Ma Yau prepares to conduct a major concert. The twins accidentally switch places, causing confusion for both of them until they discover each other. The twins also have romantic interests named Barbara (Maggie Cheung) and Tong Sum (Nina Li Chi). Eventually, the twins defeat the gang that has been threatening them, and marry their romantic interests."